Appropriate utilization of fisheries resources is still growing. Development of environmentally friendly methods is carried out in an effort to maintain its carrying capacity. One concrete example was done by a lecturer from the Department of Fisheries Resources Utilization, Faculty of Fisheries and Marine Sciences, Bogor Agricultural University (PSP FPIK IPB), Prof. Dr. Ir. 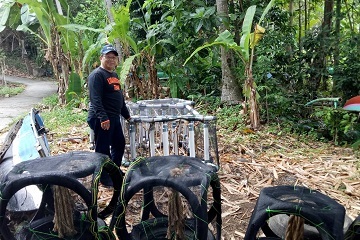 Mulyono S. Baskoro, M.Sc, and his team by creating portable rumpon and squid attractor. Recently Prof. Mulyono socialized an efficient technology in the field of fisheries resource utilization in Lampung (26/10). Socialization had been carried out in 30 regencies throughout Indonesia. The socialization delivered to the fishermen was related to the portable rumpon and squid attractor. Prof. Mulyono created portable rumpon with a team of lecturers from FPIK IPB namely Dr. Roza Yusfiandayani, S. Pi and Prof. Dr. Ir. Indra Jaya, M.Sc. The advantage of this tool is its practicality that can be easily dismantled and installed. Portable rumpon uses raffia and sound frequencies as attractors who can collect fish at a certain point. Portable rumpon was recently named as one of the Top 10 Innovations of 261 Innovations in Indonesia at the Indonesia Innovators' Innovation Expo (I3E) Exhibition 2018 which is a program of the Ministry of Research, Technology and Higher Education (Kemenristekdikti). Portable rumpon is developed from conventional one which is usually installed permanently. The use of conventional rumpon has a high risk in the waters because ships operating in a location installed by the rumpon can be damaged. In addition, there is overlapping use of fishing gear such as the presence of drifting nets that can damage the rumpon. Portable rumpon is triggered as a practical solution in an effort to utilize appropriate fisheries resources. Squid attractor is an efficient technological innovation in the field of fisheries resource utilization for the first time in Indonesia, which was coined by Prof. Mulyono. Squid attractor is used to attract squid to lay eggs in the attractor area. Squid laying season usually happens during the rainy season. Apart from being used to help fishermen in catching fish, the squid attractor can become potential fishing areas at a depth of 3-7 meters from the shore. "This is the dissemination of appropriate technology that can be applied to assist fishermen in the business or development of fisheries. Squid attractor is made from drums, pipe, and many other tools which are then put together with a rope. This is where the squid will put their eggs. The development of this attractor is still being carried out in order to make it as a practical tool used by fishermen," he said (AD/ZSP/Zul).